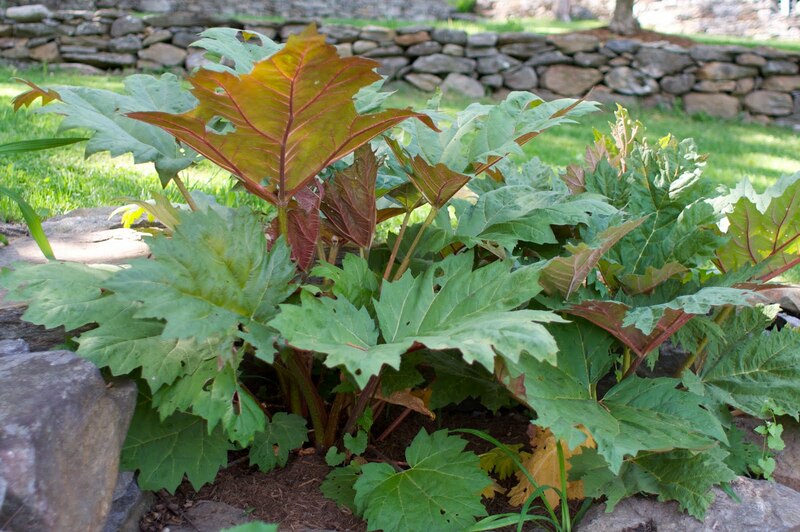 Here is our rhubarb patch in all its leafy, red-veined fury. It more than holds its own against four-footed destroyers, who otherwise declared victory in the gardening battle years ago. 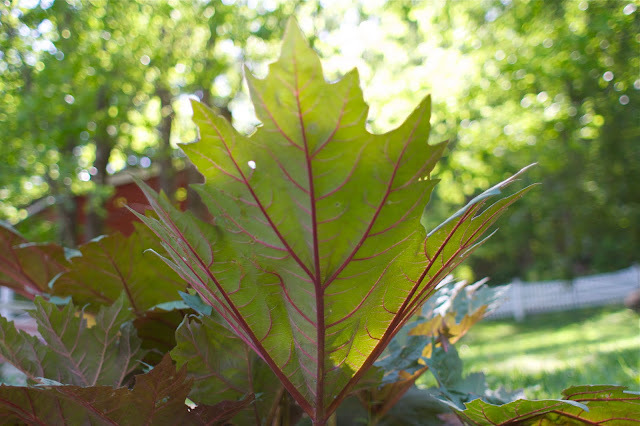 Aside from a few insect nibbles, these plants sally out of winter and bolt through summer largely unscathed–faring better than the poor, tender chard did. Their home, in northwestern Connecticut, is also our home when we can be there: a tiny little house in a hollow with soft, terraced hills and a good spring that fills our well with clear water. The house was begun in the late 1700's, and I wonder a lot about those first, hardy souls who laid stone upon cold, gray stone to build the walls and foundations, because we occasionally find their rusty remnants–their axe heads and horseshoes–strewn at the edges of the woods and poking up out of frost heaves. 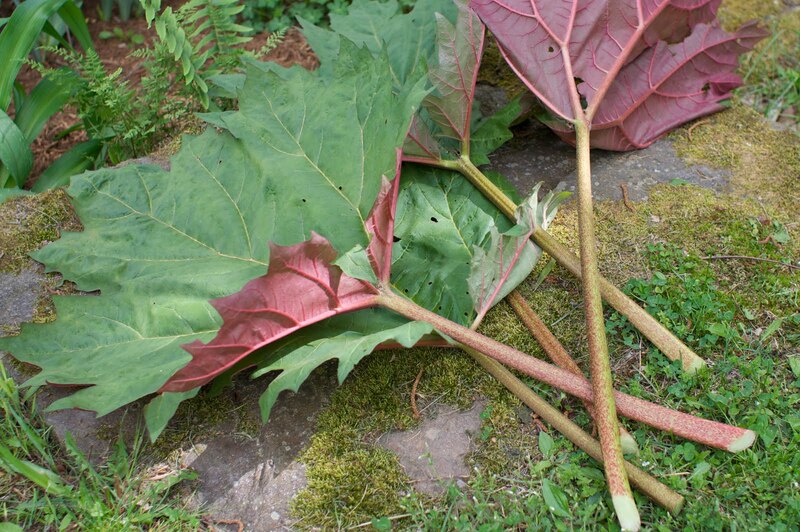 I imagine those folks must have been a lot like rhubarb, themselves: brave, ruddy, and not just a little bit cantankerous. They knew a good story or two, because they had little else to do in cold weather but sit around the wood stove and warm their spindly legs–and there was little more to the original house, really, than an enclosure for that fire. Maybe, in its glow, they let their guards down and allowed their sweet sides to unfold. 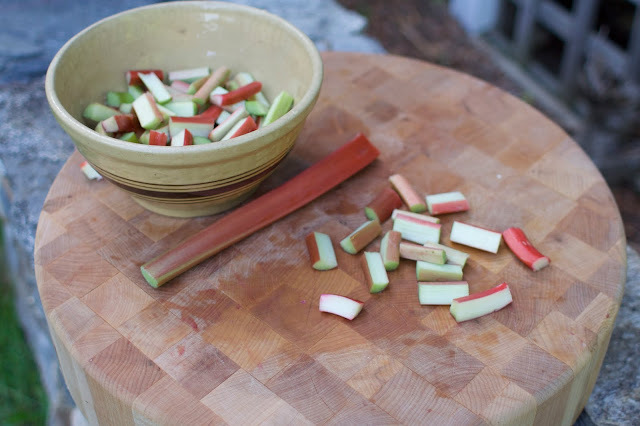 Perhaps, like us, they grew shocks of rhubarb and looked forward to this first fruit of spring (we know those stalks really aren't fruits, of course, but we dice and sugar them into thinking they are). I hope to always live in old, hand-me-down houses, just to feel the lives that have passed through them and etched marks on the beams over the centuries. 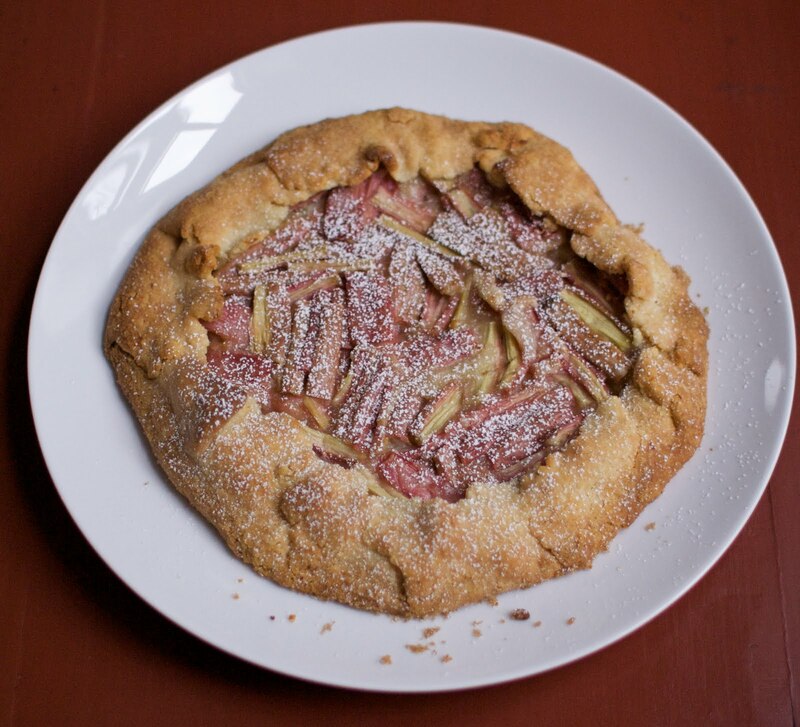 For now, we're just tending house for the next generation...and while we're there, enjoying our rhubarb tarts the rustic, old-fashioned way: in nutty, free-form crusts that know no tart molds or pie pans. Preheat oven to 400 degrees. Chop rhubarb into lengthwise strips, then crosswise so you have thin segments, about an inch long and 1/4 inch wide. 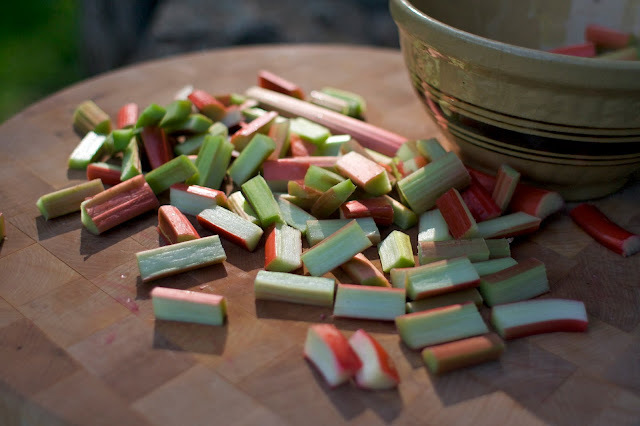 Toss rhubarb pieces in a bowl with 3/4 cup sugar and 2 tablespoons flour, and set aside. Take dough from refrigerator. In a small bowl, mix together 2 tablespoons almond flour and two tablespoons sugar. Crumble almonds coarsely into mixture and stir. Sprinkle this mixture onto dough, leaving a 1 1/2 inch border unsprinkled. Arrange the rhubarb pieces on top–the mound will be very tall. 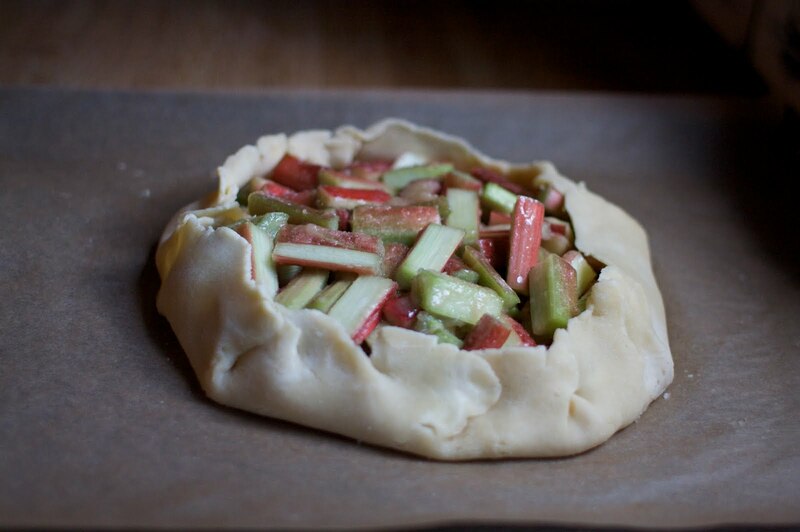 Take the border of dough and fold it up and around the edge of the fruit, crimping and pinching it at intervals. You want to create a strong dam around the fruit, which will give off juices as it cooks. If dough cracks, pinch it shut. Brush border with melted butter and sprinkle with sugar. Bake in the center of the oven for about 45 minutes, rotating after 15 minutes and flattening down fruit gently with a spatula. When galette crust is golden and fruit is soft, remove from oven and cool for about 15 minutes before serving. Serve with whipped cream, creme fraiche, or ice cream. Put flours, sugar, salt, and butter in the bowl of a food processor and pulse until the largest lumps of butter are the size of peas. Or, working quickly, rub butter into the flour mixture with the palms of your hands until pea-sized butter pieces remain. Next, slowly drizzle in ice water, mixing, until dough just barely comes together but is still ragged. Only use as much water as you need. Press dough into two disks and refrigerate, wrapped in plastic, at least 30 minutes before using. Growing up, as much as life changed from year to year, I could always predict one constant: Baskin Robbins ice cream cake, mint chip, on every family member’s birthday. You know the kind: so green it’s practically blue. Surely we must have shared a mutual mania for this flavor, for it to endure year after year, right? The answer is no, but Mom did, so there was never any question what we were getting–and we learned to love it. She ordered a cake twice the necessary size, then after the last of the cracked-out party guests was carted home, she sliced and squirreled away a nice little stash for herself at the back of the freezer, cleverly barricaded behind a forbidding wall of my father’s frozen stocks and animal bones. Sneaky Mom, you didn’t think we were on to you? Except one year, maybe it was my ninth birthday, I rebelled and went with the seasonal pumpkin pie flavor for my party cake. She must have been devastated, but Mom bit her tongue and did the ordering (half the usual size). It fell flatter than a spinach crepe among the invitees, who were horrified by the hunks of orangey-brown cake melting into even more revolting rust-colored puddles on their plates, and I had to admit right then and there…Mom knew best. A month ago we visited my parents, and my younger daughter’s birthday fell during the visit. Of course my mom surprised her with a…wait for it…Baskin Robbins mint chip ice cream cake, ablaze with four candles. Only, half the cake had to be vanilla, because the birthday girl does not actually like mint chip. But here’s the thing: although I really do like B.R. mint chip occasionally, I really do, it’s like going on a joy ride with the high school bad-boy in his brightly colored muscle car. You wind up with a queasy stomach and secretly admit it’s not really all that good for you. 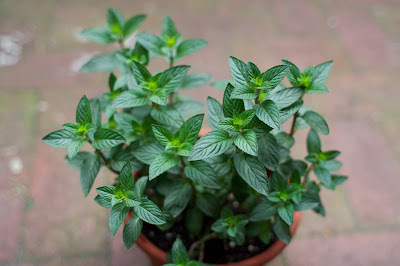 I vowed years ago, after tasting a boule of Feuille de Menthe at Berthillon in Paris, that I would start making my own mint chip–from the real, leafy deal, not the stuff that dribbles out of a wee bottle. And I wouldn’t add food coloring, either, no matter how much a colorless mint chip might unsettle some people. 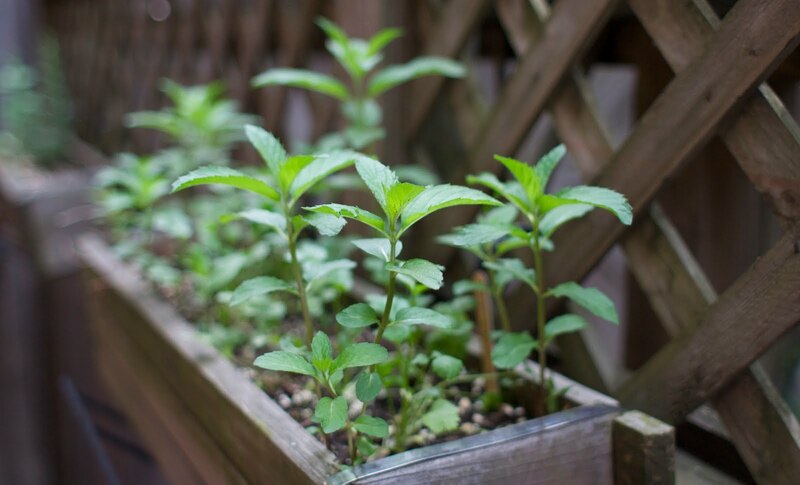 So I always keep at least two kinds of mint growing, to infuse into my own mint leaf ice cream and give it layers of flavor. Mint overwhelms us each year because, make no mistake, it’s a weed–albeit a tasty and refreshing one. If you have a black thumb and are bummed out about it, I recommend buying yourself a pot of mint. Replicating those chips–or rather flaky shards, as I should describe them (frankly the best part of the classic B.R. variety)–was a bit more difficult, but then I learned the trick while working as the assistant to the pastry chef at a French restaurant in New York. We used to do this thing with the pistachio ice cream. After the machine churned out the frozen product, we would scoop it into quart containers and one of us would pour a thin, steady stream of bittersweet chocolate onto the ice cream while the other stirred like hell. And the other was usually me, getting yelled at to stir faster, faster, choking back tears as blisters ballooned on my hands. You had to stir fast as a cartoon, or else the ice cream would melt and the chocolate would settle into thick, unseemly clumps–call it the Magic Shell effect. Ideally, the thread of liquid chocolate would freeze on contact and disperse evenly and elegantly throughout the frozen custard. Then, when you ate the ice cream, whispers of chocolate would dissolve on your tongue–rather than cracking your teeth open, like big hunks of frozen chocolate do. I was really good at it for a while and even mastered the skill at home, solo, pouring and stirring in dexterous rhythm. I can still do it–though, sadly, my skills have gone flabby and would never pass muster in a 3-star French restaurant. So Mom’s on her way up to visit right now. And guess what I made for her? Yep, it’s waiting in the freezer for when she gets here. But the real reason she’s making the drive is not to celebrate Mother’s Day or sit down and eat a bowl of mint chip ice cream with me….it’s because my sister just had a baby, just in time to celebrate her own first Mother's Day! Woohoo! He–my new nephew–weighed in at 10 ½ pounds at birth, and none of us can figure out how that happened, but my sis needs all the help and feeding she can get. She’s not a big girl by any stretch, and this heft of baby is unprecedented in our family, but somehow this clever boy siphoned off every bit of the good food she enjoyed while he was still hooked up: countless stracciatella crostini at Roman's, sushi at the Tsukiji fish market in Tokyo (just kidding, doctor), slow-roasted pulled pork shoulder I made for her baby shower. He already knows the good stuff, and I have a feeling things will continue in the same vein, so I’m taking it upon myself to feed her, and indirectly him, as best I can. Starting with my double-mint leaf/chocolate chip ice cream, which I stirred solo like a madwoman and left hidden behind a fortress of scary items in her freezer, while she was in the hospital. Cass, have you found it yet? Note: allow time for custard mixture to cool, 8 hours or more. I usually do this on consecutive days. 6 ounces good quality bittersweet chocolate (like the Callebaut 70%), either chopped coarsely if you're going for the melt-and-stir method, or chopped extremely fine if you want to take an easier path. Mini chocolate chips are fine, too. 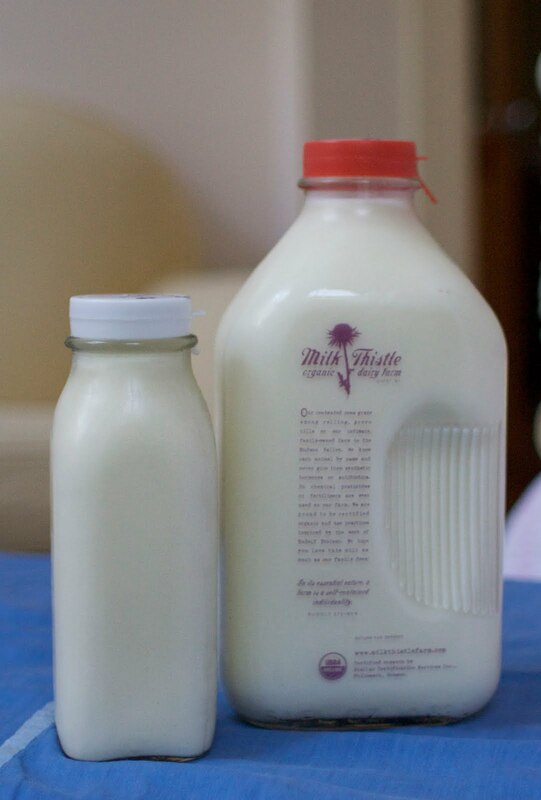 Put milk, cream, and half the sugar in a heavy saucepan and whisk to combine. Set over medium-high heat. In a medium bowl, whisk together yolks and other half sugar. 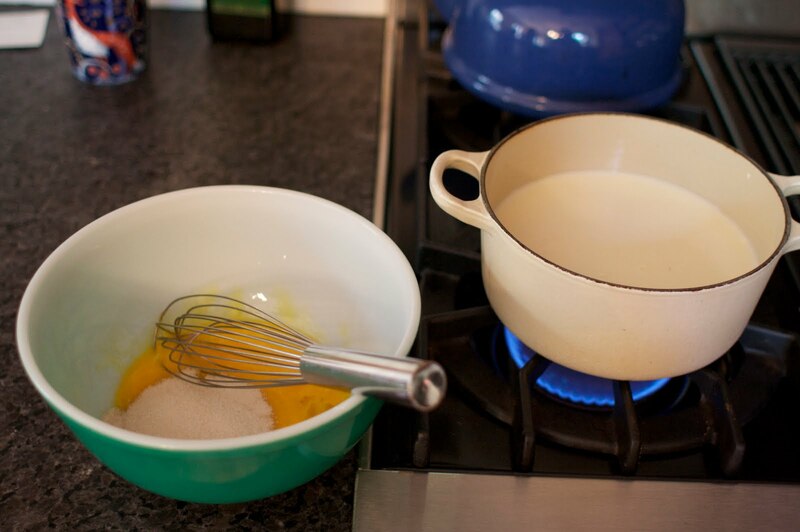 Watch the cream mixture very carefully until it just begins to foam and bubble on the sides–it will boil over quickly! Turn heat off and ladle some of cream mixture into yolks, whisking it together. Do this with a few more ladles full of cream mixture, then turn heat back on very low. Pour contents of bowl back into saucepan, whisking the whole time, until mixture begins to thicken slightly–enough to lightly coat the back of a spoon. 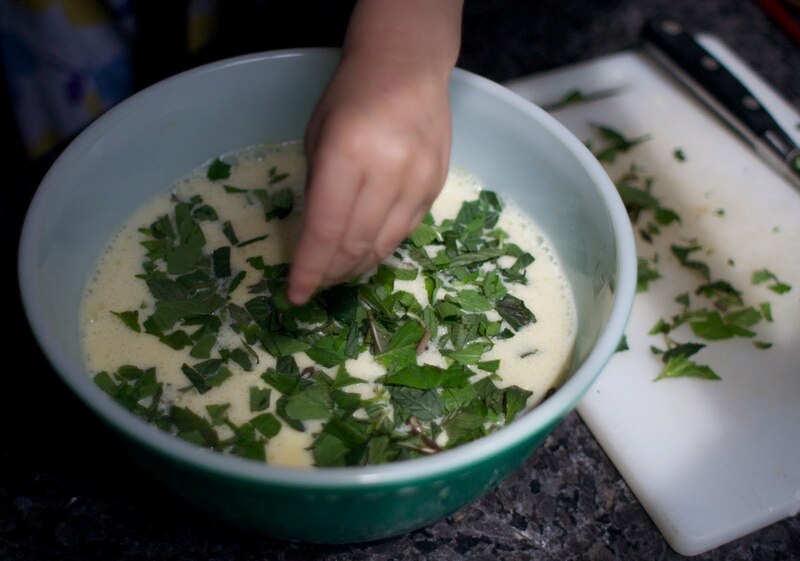 Pour back into the mixing bowl and stir in mint leaves. To cool more quickly, set the bowl over a larger bowl with ice in it. Cover with plastic wrap with a couple of holes poked in it–this will let steam out and prevent a skin from forming. Refrigerate, stirring occasionally, at least 8 hours or overnight. Mixture must be very cold for most ice cream makers. When ready to freeze, get your ice cream maker ready, and also put container that will hold ice cream into the freezer. Immediately before using, strain ice cream mixture into a clean bowl with a mesh strainer, pressing on mint leaves to extract maximum flavor. Discard leaves. Freeze ice cream according to your machine's instructions–I use a simple canister machine from Cuisinart and it takes me around 20 minutes. Meanwhile, the chocolate: If attempting the melt-and-stir method, make a double boiler with a metal bowl and saucepan while the ice cream is freezing. Put a little water at the bottom of the pan (should not touch bowl) and bring to a gentle simmer. Put the bowl on top and fill with all but a few pieces of chopped chocolate. Melt chocolate slowly, and when it's just melted, remove bowl and stir remaining pieces into the melted chocolate until they melt, too. You want the chocolate to be liquid but not hot–you can test by touching a little chocolate on your lower lip. If you curse, it's too hot. Should feel nearly room temperature. When ice cream is thick and frozen, you can do one of two things. One, simply stir in chips or thinly chopped chocolate, and put in the freezer. Or Two, proceed from above: transfer ice cream into cold container (or leave it in the canister with paddle removed). 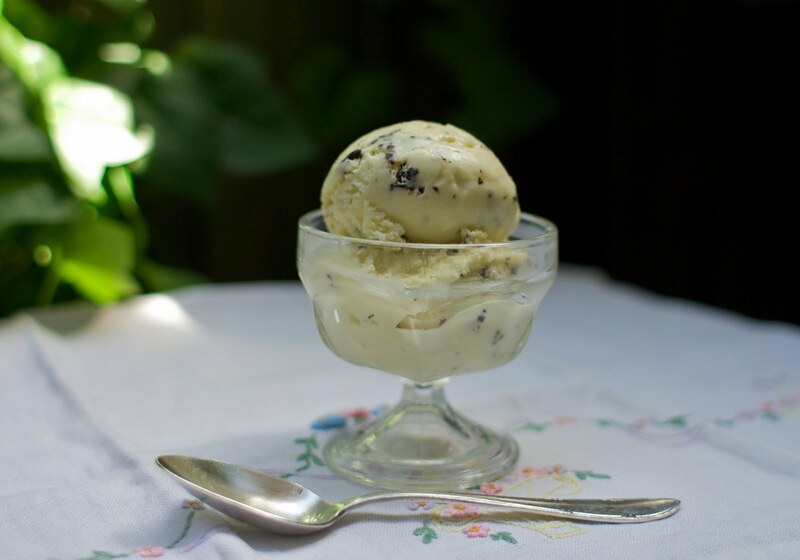 Have a big mixing spoon with the chocolate and a wooden spoon or spatula with the ice cream. Partner up or go solo. One hand drizzles a thin stream of chocolate into the ice cream while the other stirs it in furiously. Faster! Faster! Work quickly, stopping once you are satisfied with the distribution of chocolate.